I was having a good old case of the blues the other day. So John, being the perfectly fine tuned boyfriend he is , took it upon himself to create something yummy to get me out of my slump. Whilst laying on the couch in lala land, I could hear the sound of not so small feet, tap dancing around in the kitchen, in and out of the garden like a squirrel gathering nuts for the winter. John was clearly thinking “outside of the box” with this recipe. This pizza features the basics of fresh tomatoes, and mozza. The difference is that he barbecued the crust first , and added fresh pesto, and the trump card ” Canadian Back Bacon” . Genius! First you can make a batch of your favorite pizza dough . We make a whole wheat one in the bread machine . While the dough is proofing, take this time to make the pesto I have posted on the site here . After you roll out the dough evenly on a large piece of parchment paper, brush one side with olive oil. Place, oiled side down, directly on greased grill over medium heat. Grill, uncovered and watching carefully to avoid burning, until there are nice grill marks on the bottom, around 5 min. Slide a large spatula under the pizza to flip and put it on a pizza pan turned upside down , close lid, lower the heat to low and finish cooking about 1 minute. 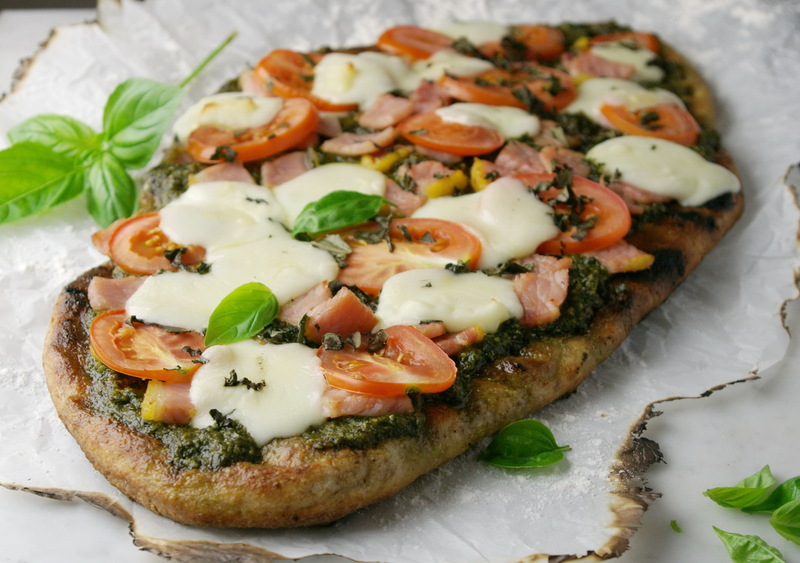 Spread a nice fairly thick layer of pesto over pizza , then add tomatoes, Canadian Back Bacon, and cheese. Place the pizza back onto grill. Close lid and grill until bubbly and underside is browned, about 5 min. Sprinkle with basil. Remove from barbecue, get out the pizza wheel, or you can do it the high tech way , cutting the pizza with scissors . This entry was posted in Home, Pizza and tagged Back Bacon, Barbecue grill, Dough, Olive oil, Pesto, Pizza by Ginger Smoothy and Otto Pilot. Bookmark the permalink. OH Canada! I like the idea of barbecuing the crust and Canadian bacon eh!